Deveron UAS Corp., is pleased to provide growers with Soil Sampling Collection Service and Analysis. This crucial layer is the base for all Precision Ag management programs. Analysis and Reports are provided through A&L Canada Laboratories Inc.
1 – Grid (Site Specific): Standard grid or Smart grid uses site-specific locations to collect multiple soil samples throughout the field. Your field will be divided into 1 ac, 2.5 ac, or 5 ac grid pattern, and a separate soil sample will be collected from each grid point. 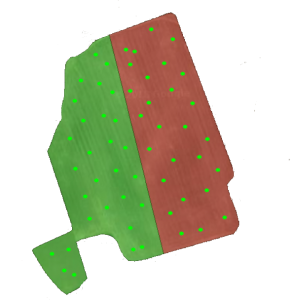 Grid Sampling is beneficial to determine fertility at specific points within the field. 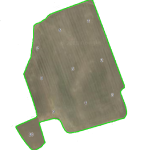 2 – Zone : Zones are created based on historical yield data, UAV, or soil imagery. The data is analyzed based in the unique characteristics of the soil. We are offering 2.5 ac, 5 ac, or 10 ac zones. Once the zones are created, several samples will be collected from each zone and combined together as one sample per zone. 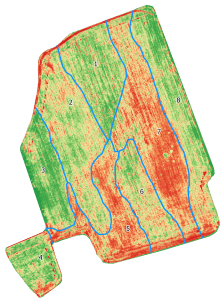 Zone sampling allows the grower to learn more about the fertility in specific zones within the field. 3. – Bulk (Composite): We arbitrarily divide the field into broad regions. Within each region, several soil samples are taken and combined together as one sample per region. We are offering 10 ac, 25 ac, and 50 ac. Bulk sampling is beneficial to determine the general fertility of each field. Soil data can also be used for. Please register for more information and one of our reps will reach out to provide you with more information.